Heat oven to 275°F. Place oven racks in upper and lower third of oven. Line 2 large cookie sheets with cooking parchment paper. In large bowl, beat egg whites, cream of tartar and vanilla with electric mixer on high speed until foamy. Beat in sugar, 1 tablespoon at a time; continue beating until stiff, glossy peaks form and sugar is almost dissolved, 5 to 6 minutes, scraping side of bowl occasionally. Do not underbeat. In small bowl, place 2 cups of the meringue. Sprinkle cocoa through fine mesh strainer over top; fold cocoa into mixture. Place large piping bag fitted with large star piping tip on its side. Using large icing spatula, spoon half of white meringue so it covers one half of the length of inside of piping bag. Carefully spoon half of the cocoa meringue on top of the white in bag. On cookie sheet, pipe into 2-inch circles. Repeat filling piping bag and piping with remaining meringues. Place both cookie sheets in oven. Bake 30 minutes. Turn off oven; leave meringues in oven with door closed 1 hour. Remove from oven, and place pans on cooling racks; continue to cool at room temperature, about 2 hours. Remove from parchment paper; place on cooling racks. Place waxed paper or cooking parchment paper under cooling racks. In small microwavable bowl, microwave chocolate chips uncovered on High 30 to 60 seconds, stirring halfway through, until chips can be stirred smooth. Spoon into resealable food-storage plastic bag; partially seal bag. Cut small tip from corner of bag; drizzle chocolate over tops of cookies. 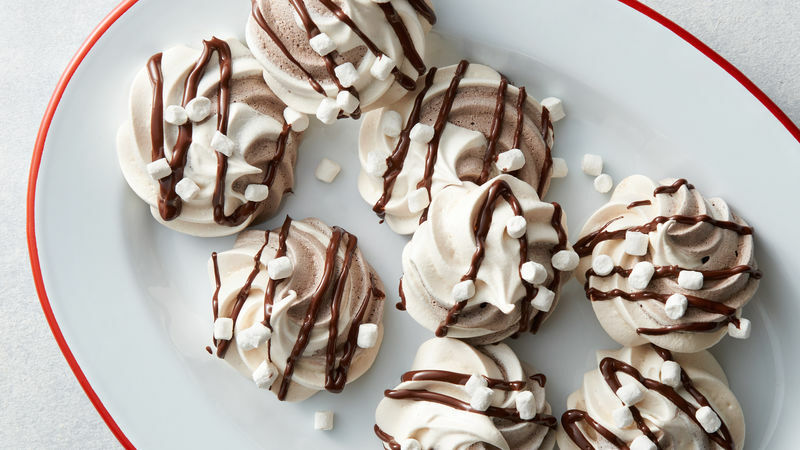 Sprinkle mallow bits on tops of cookies. Let stand 1 hour 30 minutes or until chocolate is set. Store covered in airtight container in single layer. We tested with Hershey’s™ Special Dark™ cocoa, but unsweetened natural baking cocoa will also work. Egg whites whip best at room temperature; for food safety reasons, limit to 30 minutes at room temperature. Make sure egg whites are yolk-free, or your meringue may deflate. To prevent mixing yolk into the whites, crack eggs, one at a time, and place each white into a custard cup to ensure it is free of yolk before transferring it to the mixing bowl. A clean glass, metal or copper bowl is best for whipping meringue. Mallow bits can be found either in the baking aisle or the ice cream toppings section of grocery stores.